We can all use a little luck, especially when it comes in the form of a cute little cat! While “Maneki” actually means to beckon, and “neko” means cat, this beckoning cat does more than just wave out to you. It is a good luck charm, believed to bring good fortune to its owner, and has become known world-over. You’ll find them adorning the entrances of shops and businesses or kept in homes as ornaments. Maneki-Neko is thought to have originated in Japan sometime in the mid to late 19th century. While no one is sure how this lucky cat came to be, there are various interesting legends that try to explain its origin. The most recognised legend tells the story of a wealthy feudal lord who once took refuge under a tree, next to a temple, during a violent storm. 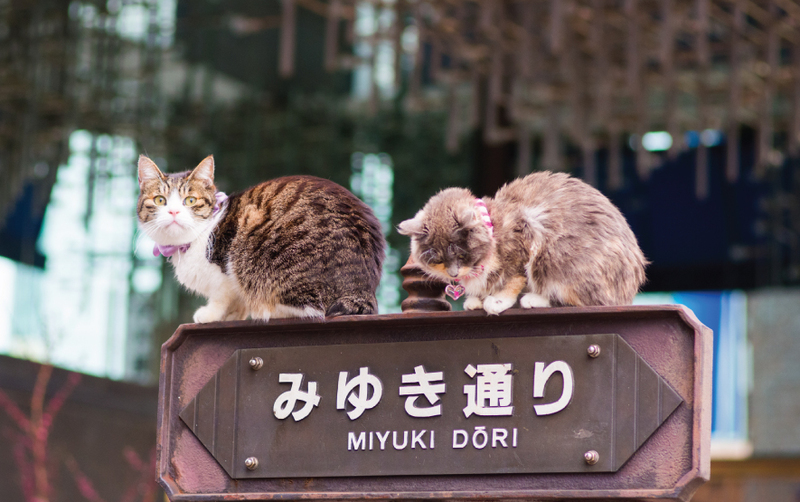 He noticed a cat that seemed to be beckoning to him, and so he followed it to the temple. In doing so, he narrowly missed the lightning that struck the tree he had been taking shelter under. In his gratitude, he showered the temple and the poor priest that lived within, with lots of money and gifts. Thus, the cat had brought good fortune to its owner, the priest. Both paws of the cat hold varying significance. If the right paw is raised, it attracts good fortune and prosperity. The left paw raised is said to attract customers, which is ideal for shop owners and businesses. If both paws are up, it is said to represent protection. 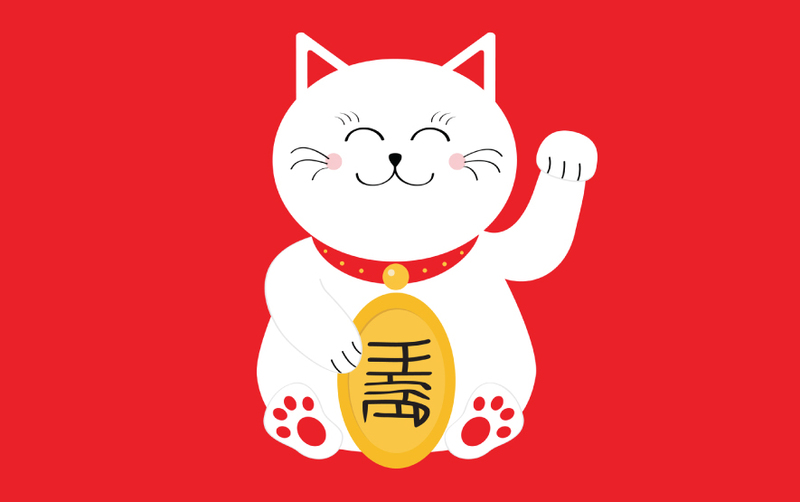 You’ll find that the Maneki-Neko comes in various colours, but did you know that each colour has a different meaning too? Spotted cats are said to be the luckiest, in their traditional colours. The white cats represent happiness and positivity. Gold is— but naturally—for wealth and prosperity. Black cats ward off evil spirits, and red or pink cats are said to bring harmony in love and friendship. Green attracts good health. Then again, you don’t have to choose. You can have them all! The Maneki-Neko is smartly dressed, flaunting a bib, a collar, and a bell. This goes back to the Edo Period when cats were popular among the wealthy members of society, and were dressed in this way. You’ll find the fortune cat holding symbolic things in its paw, like a koban—a gold coin from the Edo Period what was worth one ryo, the Japanese currency before the yen. A ryo was quite the fortune in those days. The cat could also be holding a mallet, representing wealth, or a fish, the symbol of abundance and good fortune. 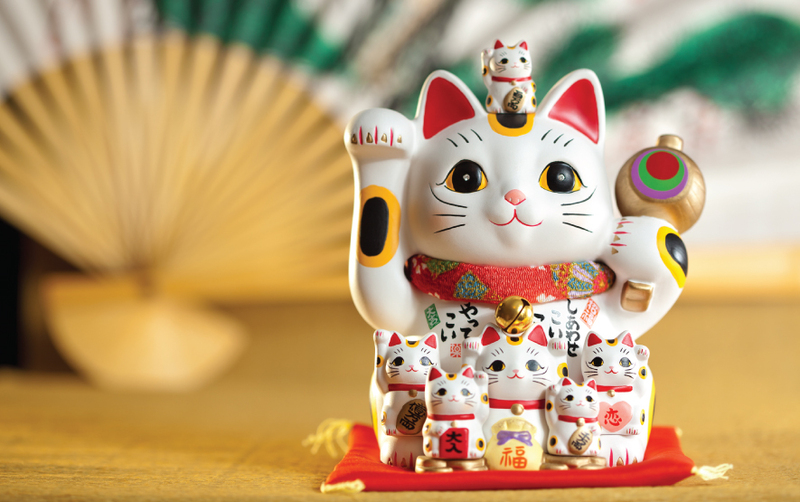 The Maneki-Neko makes for a well-received, popular gift for your friends and family. If you’re visiting Japan, consider taking them back with you, as gifts or for yourself. 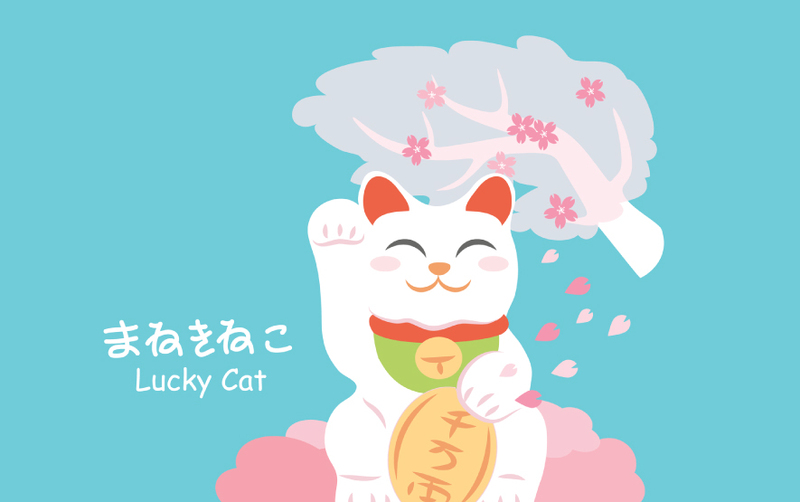 It’s always nice to have a little good luck charm that’s as endearing as this very special Japanese cat.